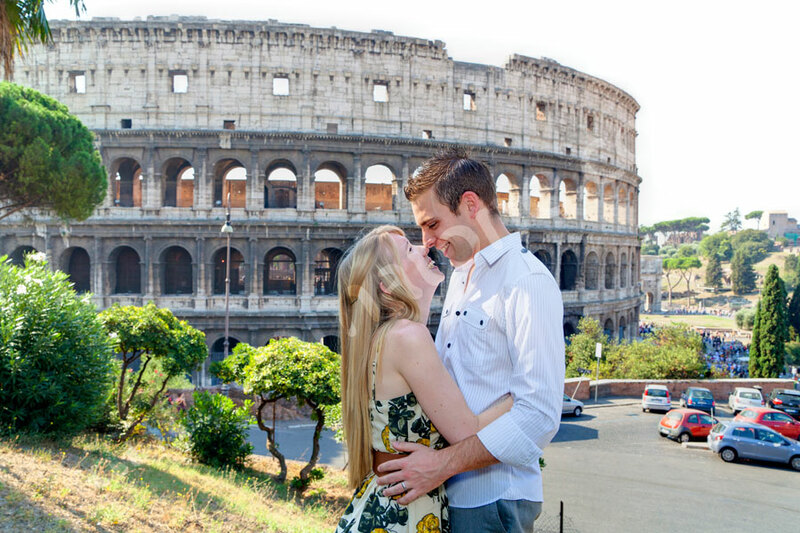 The Roman Colosseum can be a spectacular location for an engagement like photo shoot especially when you are taking pictures of a couple in love on their honeymoon through Europe. The weather was just perfect as we circled around the Colosseum looking for new angles and perspectives. Only to stop in a bar for a cup of something or an execute for a pretty view from the inside. Great pictures come when you are relaxed and at ease. A wonderful experience which finished when we went back to the hotel to capture some unique images from the terrace. We went all the way up the top floor. What a nice view from above! Not to mention the really nice pool which looked so inviting! A romantic honeymoon picture session. In around the environs of the Colosseum with final pictures on top of a hotel with a stunning terrace view.